It wasn’t so long ago that a friend of ours, One Richard Whitethread gave us a link to a band page and stated that they needed to be featured on this lovely podcast of ours. Then without thinking Liz and myself were soon sat down with these for doom dwellers at Sunlight Studios in Gillingham to talk about the debut release from one “Desolate Pathway”. We were able to see the album being made first hand and we are now proud owners of the album in question. This album being “Valley Of The King”. Brainchild of one Vince Hempstead started has now been given Life with the addition of Simon (Vocals), Jim (Bass) and Mag (Drums). Valley Of The King sets the tone of a jouney to be taken by all listeners. You will be immersed in the world Vince has created and once its over you’ll be beginning for more. Digital version is as a little as £3.50, where as the Physical version is only £7. So get your arses over and pick up this epically retro slice of doom! 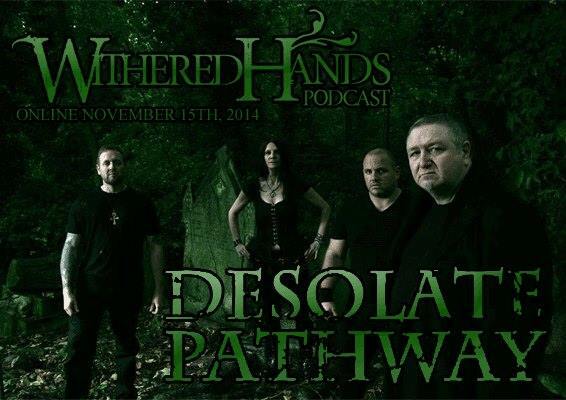 You can also check out the band at https://www.facebook.com/desolatepathway where they are regulary updating the page with news and photos and all you could need to stay in the no how. The band have also lauched a website…http://www.desolatepathway.com. So keep your fingers on the pulse for new updates, shows and much much more!! So sit back, grab a cold one and embrace doom music from the core! !